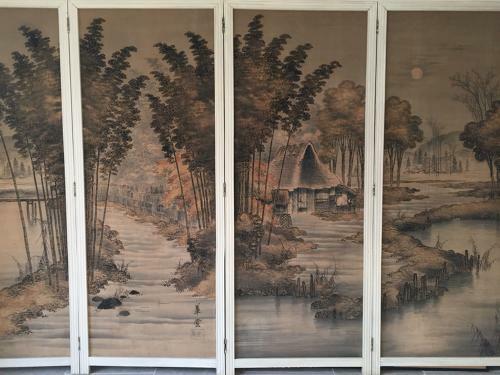 An incredible Japanese Birodo Yuzen four fold screen. Yuzen is a technique first invented in the C17th where by an image is created using velvet which is hand cut, shaved and dyed to create a picture. Beautiful perspective and landscape detail as well as lovely subtle colours. This textile is most likely created in the Meiji period c1910. It is later framed in a four fold white painted panel screen.